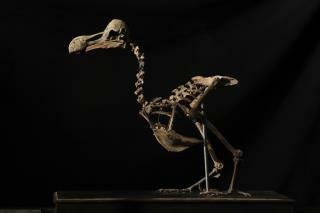 (Newser) – All that's left of the dodo bird is a smattering of bones—a nearly complete set of which has just sold for $431,000 at auction. This "extremely rare" version is one of the most complete with about 95% of bones present, reports the BBC. Only a portion of the skull and a set of claws are lacking, reports CNN. The skeleton—believed to be the first sold since 1914—was actually pieced together over four decades by a collector, which isn't atypical. "There are only twelve close to complete dodo skeletons in the world," all in the possession of museums, and all but one are composites, says Erroll Fuller of Summers Place Auctions in the UK. Found on Mauritius in the 16th century, the dodo disappeared by the late 1600s at the hands of humans and newly introduced dogs and monkey, Fuller says. So I guess because of the century in which it became extinct, no DNA exists. Too bad, though even if we could clone one again, I don't know where it could live anyway.